Green House Seeds Super Lemon Haze has won the 2008 High Times Cannabis Cup with a landslide of votes. Its incredibly intense lemony flavour, with a strong haze background has a sharp and intense taste, which reminds of lemon, lime and pink grapefruit, followed by a very earthy and musky haze aftertaste, with traces of incense and black pepper. 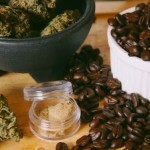 The effect is very balanced; it starts with a quick indica-hit feeling that softly moves to a very strong high, with a social and creative side. 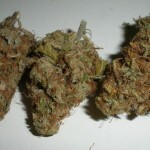 The Super Lemon Haze is a very smooth compromise between the great qualities of its parents. It’s cannabis seeds has 9-10 weeks flowering time, and a very typical Christmas tree shape. Plants tend to grow quite tall, but the internodes are not too far apart, and allow easy topping. The leaves are very sativa-like, while bud formation comes dense and has a high calyx-to-leaf ratio. 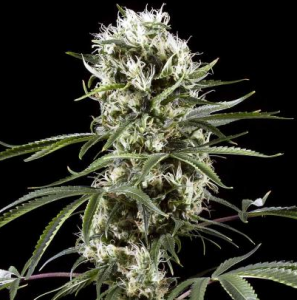 The Super Lemon Haze is very effective both indoors and outdoors, and responds very well to high-EC hydro systems as well as organic soil setups. When cultivated in soil, the spectrum of terpens is more developed and gives an extra lemony flavour. The THC is high at over 22%, ensuring a very psychedelic experience to even the most experienced smokers. 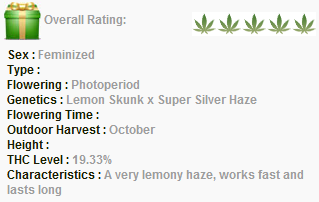 Ever smoke or grow Green House Seeds Super Lemon Haze? Leave a comment and tell us about it below!